Truly life is an emerging manufacturer of organic soaps, perfumes, lotion bars, handcrafted gifts and many more eco-friendly personal care products. The range was started by Mellenie and Andy in Virginia and includes self-grown loofahs, flowers and herbs in all their products. This ensures that the productsare made from local and natural raw materials that are defiantly safe for you. They also use recyclable and bio-degradable materials making the range safe for the environment too. You can choose from lotion bars in different fragrances, soaps made from natural ingredients such as Coconut and olive extracts, perfumes in exhilaratingfragrances containing raw beeswax and natural oils. Their soaps are hand-cut and cured for about four weeks to allow all the ingredients to form a perfect mixture. It’s smooth and gently moisturizes and nourishes .They also have a range of gift items containing an assortment of the above product for different occasions. All their products are free from harmfulchemicals and alcoholand are completely safe for your health. You can also choose from handcrafted gifts such as a heirloom box made of solid woodand treated with an special antique oil for a long lasting look. The site also has a special natural soap for dogs. Their manufacturing process is also eco-friendly and carbon conscious with a bicycle delivery for nearby areas. 3% of profits are also contributed for local charities such as the Alexandria Animal Shelter and the Lupus foundation of America. You can count of this range for being safe, healthy and locally sourced. 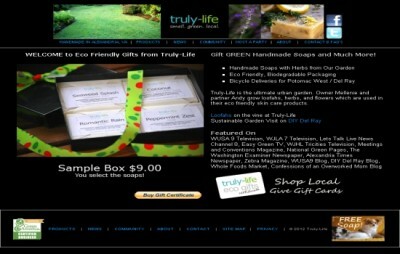 To know more about Truly-Life stores check out their site www.truly-life.com. You can purchase their range from their website and also in select stores indicated on their site.